Fuel system shouldn't cost much if you're careful and look for some good deals. Are you counting injectors in the $1000? He has no need for -8 feed. 1000+rwhp on ethanol? Sure step it up. 600rwhp on gas? No need. Install a -6 return, post filter, regular. Your pump kit should have a sock/prefilter that comes with it. Shouldn't cost much more than $550 before injectors. Yea Ill need to do alot more work before I get close to 1000rwhp, sure wont get there on a stock blower, or the stock bottom end.. The furthest Ill ho with this setup will probably be a ported snout being Im already running a 102mm throttle body. I might throw a 150 wet shot on it down the road depending on how much this setup will make. No not including injectors/fuel cell and I'm running an external pump in my case. I don't buy generic lines and fittings filters/regulator and so on, That's the one thing I won't hesitate to buy quality parts. Seen a couple cars catch fire because of junk fittings or fittings that don't match the fuel line. I went -8 because cost wise it only added less than $50 to the cost over going all -6. If you price it all out there is not much difference in the cost of fittings Most were less than a $1 more each and the fuel line is only $1.25 more per foot. Lots of ways to skin that cat. I build things to suit the goals, budget and intended usage. 600rwhp street car on pump gas doesn't need anything fancy. Guy on a tight budget doesn't need to spend extra dollars on fuel components just for brand names. Yes parts fail, but the fitting not matching the fuel line sounds more like human error than material problem. I understand your point I just don't agree in this instance. Value is important. $500 saved in the fuel system can go toward a quality injector and keep him from having to live with crappy drivability. Yes parts fail, but the fitting not matching the fuel line sounds more like human error than material problem. Well before you buy lines and fittings you might want to look further into the issue. Many failures are caused because people using lines and fittings that aren't compatible, It's not something made up it's a known issue. What do you guys think, would it be worth the 400 bucks while Im in there or should I stick with what I have? If I do decide to swap the cam, Im also thinking about going with the Texas speed bald eagle ls1 blower cam. That cam has a 227/234 duration @.050. They don't show any other specs on the cam. I'd swap the cam out. Since you're using the tsp heads go with their cam. Not on the part of the person who assembled them lol, If it's human error then it's the people selling the crap saying their lines/fittings are compatible with everything else on the market when it's not true. Or the fact that there are some brands out there that are cheap and you get what you pay for. Why skimp on fuel lines and fittings when you're not only risking your car but your life when you have a failure. I would switch the cam, You can always sell the old one to recoup some cash. Boost comes in early and is done before a turbo would so it will benefit from a cam designed for it. I'd swap the cam, but mainly because I can't think of a reason not to. I can't twist my brain into any kind of reason that smaller cam would be better with a LSA blower. Last edited by Darth_V8r; 08-12-2017 at 12:02 AM. Just joined the forum, I recently sold my FAST TB/RAILS/102 and a few other things to free up money from an unexpected family emergency. I'm starting to get back at it with a new build being a 5.3. Was going to run a custom kit with BW S475 however these LSA kits popping up are tempting! I was thinking 5.3, PRC STG2.5 Ls6 heads (Already Have), ls9 cam. Last edited by JASOONIGAN; 08-12-2017 at 08:02 AM. OK, Just spent about 2 hours shopping around and I think I have my fuel system built. Everything in cart from summit, minus the hobbs switch and injectors come to 770.00 shipped. I ordered a hobbs switch from another site for 30 bucks, and the injectors will run around 360.00 from amazon or eBay. So all in Im looking at about 1200.00 for the COMPLETE fuel system. Also this is going in a 3rd gen Camaro, not sure if I mentioned that.. I decided on a -6 feed using the factory 3/8 hardline and a -6 return with braided stainless hose. I didn't go larger because well.. I don't need it. The -6 will support up to 700 rwhp I believe, so Im leaving it alone. The line has already been replaced and and ends are currently fitted with -6 an hose fittings, so why not leave it? Pump wise Im adding a second walbro 255 for a dual in tank setup. The second pump will come on via the hobbs switch. Both lines will come out of the tank and join a -6an y block to a single -6an hose. This hose will go to a -6an inline filter, and from there connect to the factory 3/8 line. The hardline ends in the bay where I have a braided line connecting to the rail. Basically Im going to connect the braided line to an aeromotive boost referenced regulator, which will then go to the factory return less zl1 rail. The return will exit the FPR and go back to the tank. The return will go through the top of the tank into a -6an bulkhead and 90 degree fitting. I also have a vacuum block picked out for the hobbs switch and hoses going to the boost gauge and FPR. Im pretty sure I have every last fitting and hose accounted for, but I wouldn't be surprised if I need to order something else when install time comes. I even got a pressure gauge to screw into the fpr. Well car just got tuned so I figured I should update the thread. 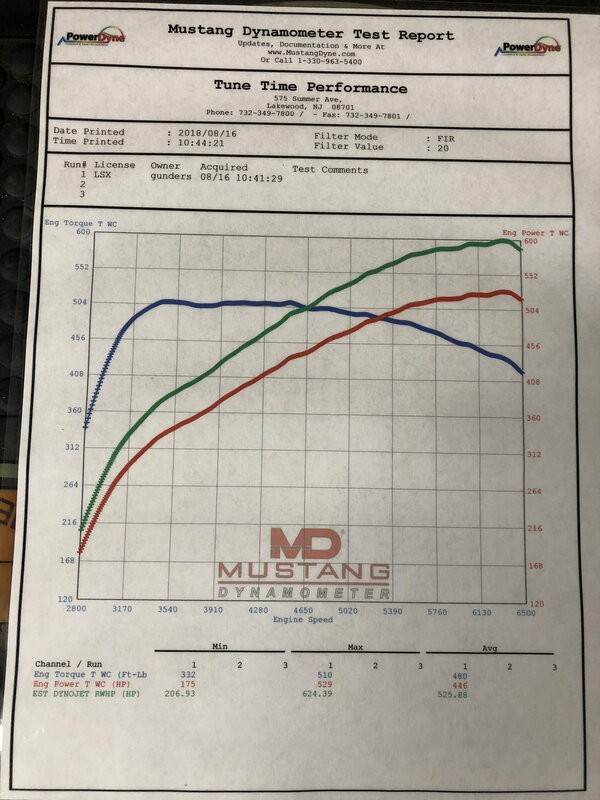 I don’t have a sheet to post yet as I’m picking the car up Saturday, but the tuner said it put down 520rwhp and 500rwtq, this was on a Mustang dyno. I decided to keep the turbo cam as well as the stock 799 heads for now. I am running 1 7/8 headers as well as meth injection. I hope to upgrade the heads and cam after I get rid of that 10 bolt. As I was reading this thread I was thinking why not run as is and see if you want more after. As for heads, Tony Mammo done a thread a while back in the dyno section about better heads on boost. if you upgrade, go to his small valve 205cc or trickflow 205 cc heads meant for that smaller bore. Then cam it for that. I've got basically the same setup with milled and ported heads241's.. Do feel there was any power left in it? Tuning wise? They tuned it with a little meth so I think timing wise it’s just about at the limit to still be safe. For sure I could pick some more up with a good set of heads. I think if I do heads, a better optimized cam, I can get close to 600rwhp mustang numbers. For now though I’m fine with the power. Even on a 95 degree day the thing spins through 3rd. Next step is a rear to actually make it usable.